The Gov. 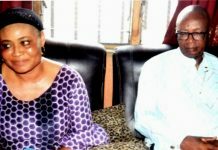 Seriake Dickson inaugurated the commission entitled: “The Bayelsa State Environmental Degradation Commission of Inquiry” last Wednesday in Yenagoa. Dickson announced that the former President of Ghana, John Kufour would be a member of the commission. He said that the terms of reference were to investigate environmental health and social economic, cultural and human damage causes by the oil spills. ”Others are to determine appropriate measures to hold defaulting parties responsible and accountable for the activities of environmental degradation. 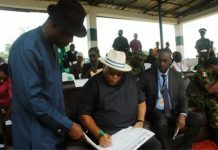 ”To invite evidence from the international oil companies within Bayelsa through evidence session,” he said. Dickson said that the Chairman of the commission is Dr John Sentamu, Archbishop of York in UK, while other members include Prof. Engobo Emesah, the Head of Law School, University of Bradford, Prof. Roland, Holder, Public Economics, University of St. Gallen, among others. In his response, , the Chairman of the Commission Sentamu assured the governor of critical examination on environmental degradation in the state. ”We are to assess and gather the impact of oil spill in the Niger Delta and activities of multinational oil companies,” he said.